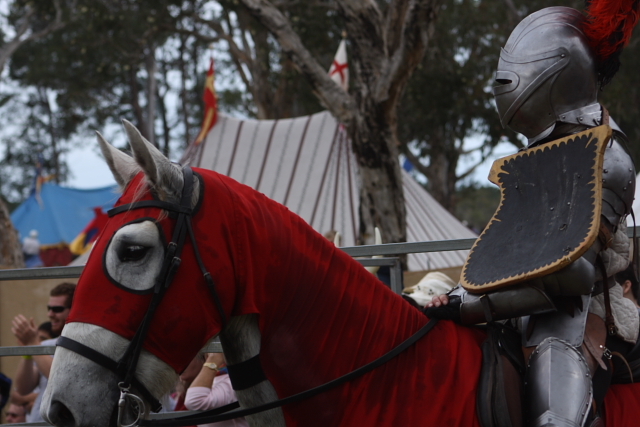 Thousands of lords and ladies turned out to re-create history and celebrate all things medieval at Caboolture last weekend. 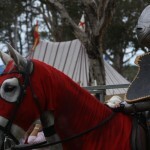 The Abbey Medieval Tournament included medieval markets, dancing, mock battles and jousting, as well as new events horse archery and falcolnry. Abbey Museum CEO Edith Cuffe said the festival was the largest of its kind in Australia, drawing more than 14,000 visitors last year. “I think we’re going to top that significantly, so we’re very excited about that,” she said. But the event had a relatively low key beginning as a fundraiser, back in 1989. “In the very first year we had 30 reenactors and 300 guests come. We thought it was pretty spectacular,” she said. Ms Cuffe said the festival was popular because it provided an accurate showcase of our common heritage and our cultural roots from the European middle ages. “One of the things with our festival that we believe has made it grow successfully is that we have a high commitment to authenticity,” she said. 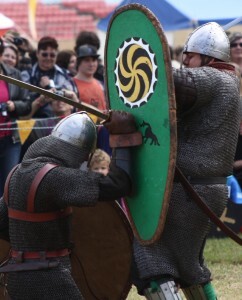 Knights Order of Lion Rampant founder Damien Fegan said his group of 14th century reenactors tried to recreate the time period as accurately as possible. “On the field today I think we’ve got 26 combatants in the tournament, plus all of their attendants, the marshals, the heralds, the ladies, the whole works,” he said. He said his group drew on an electronic database of 86,000 files and his personal library of 3,500 books to ensure their clothes, armoury and fighting techniques were the same as they were six centuries ago. Although he said participating in battles could be dangerous, the knights of his order were all fully trained. “Most of our guys train for at least 12 months before we authorise them on the field and its a constant assessment process, so if we don’t think they’re up to scratch we take them off the field.” he said. if you want to do a more revealing article investigate the group that own and runs the tournament grounds- best to use serious shovels rather than chicken scratching.